Lower eyelid surgery Augusta Evans Georgia–With age, bulges or bags can develop in the lower eyelids. This is commonly accompanied by excess skin. In some individuals, the lower eyelid skin may change in texture to become crepe-like and the eyelid, itself, may even loosen and sag. All of these lead to a fatigued, tired appearance. 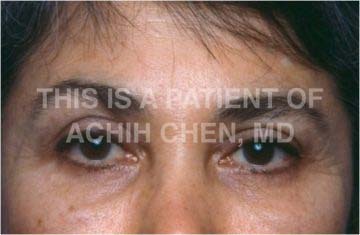 Dr. Achih H. Chen can reverse these signs of the aging lower eyelid with many different, innovative lower eyelid surgery (blepharoplasty) approaches at our Evans and Augusta, Georgia facial plastic surgery practice, also serving Aiken, South Carolina. The eyes are often the major focus our initial attention when we meet another individual. As it is commonly said, the “eyes are the window to the soul”. Since our eyes are under so much attention, they are often the area that we first notice initial signs of aging. Puffiness or even bags of the lower eyelids can develop as early as in the 20’s or even earlier. 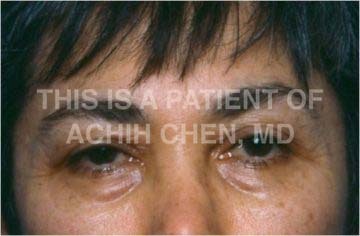 This is most often due to a weak or lax orbital septum—the curtain that holds the fat in place around the lower eyelid. Weakness or laxity of the orbital septum results in a bulge or bag. 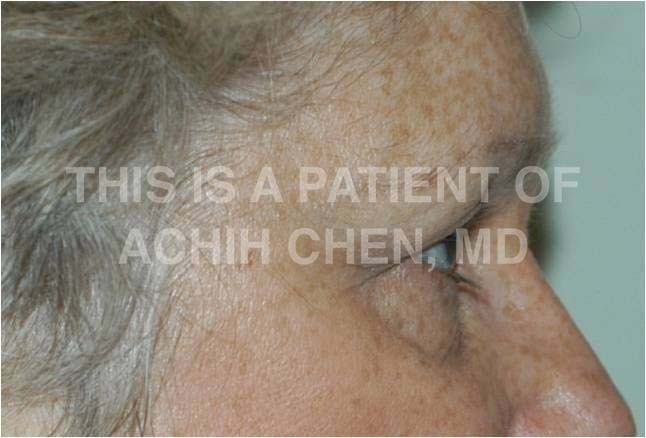 **This is a patient of Dr. Achih H. Chen who has given consent to use this photo. Initially, this can be addressed with fat removal only. Often, this can be accomplished with a lower eyelid surgery (blepharoplasty) that does not involve a skin incision. Instead, the fat is removed from an approach through the inner side of the eyelid. 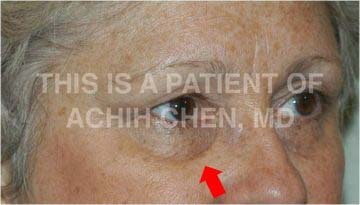 This approach is called a transconjunctival blepharoplasty. 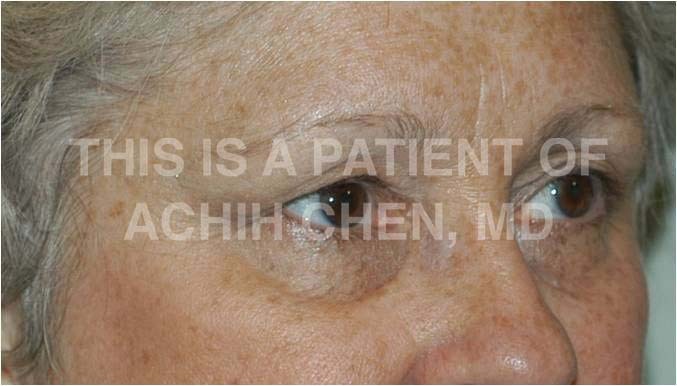 With time, excess skin develops to accompany the lower eyelid bulge or bag. In individuals with both excess skin and lower eyelid puffiness or bags, the type of lower eyelid surgery called a transcutaneous lower eyelid surgery (blepharoplasty) works best. This involves a skin incision hidden just below the lash line so that the excess skin may be removed along with the bulging fat. Once healed, the skin incision for the transcutaneous blepharoplasty becomes nearly invisible. 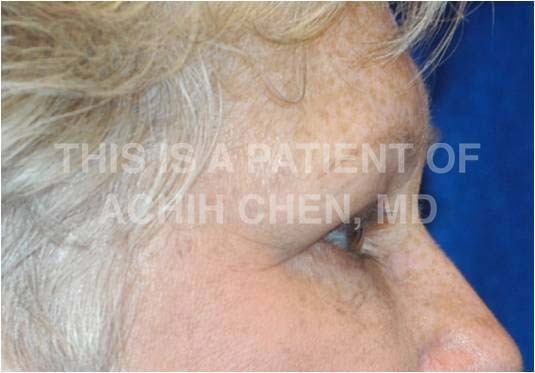 The aging lower eyelid can present numerous issues, but Dr. Achih H. Chen has many innovative approaches to address these problems. Lower eyelid surgery in Evans and Augusta, Georgia and for patients in the Aiken, South Carolina area can greatly improve your excess upper eyelid skin, opening up your eyes and brightening your appearance. 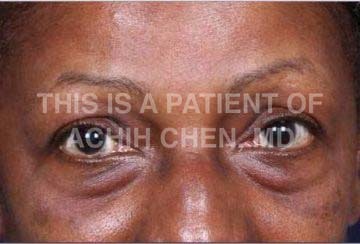 * Please contact Dr. Achih H. Chen for more information or to schedule a consultation at the Georgia Center. 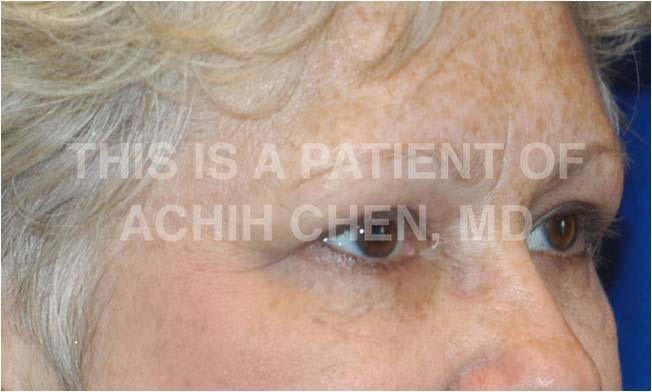 In even more advanced aging of the lower eyelid, skin changes may accompany the excess skin and bulging fat. The skin becomes thin, cobblestone and crepe-like. Removal of skin or fat alone will not address this problem adequately. Instead, for long-term results, the texture of the skin needs to be addressed in addition to the bulging fat and/or excess skin for the best results. Laser skin resurfacing will change the texture and character of the skin, smoothing the cobblestone surface. * Laser resurfacing may be performed in conjunction with lower eyelid surgery to address the combination of excess skin, bulging fat and skin texture changes. Laser skin resurfacing may be completed only around the eyelids or may include the entire face. 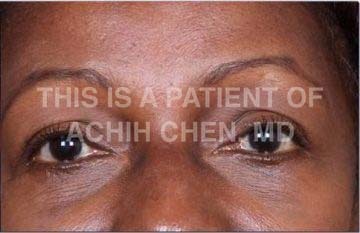 Dr Achih H. Chen can help you decide if laser resurfacing may give you an even better result to your lower eyelid surgery. As aging occurs, a separation between the cheek fat and the lower eyelid fat may occur. The result is a hollow that forms below the lower eyelid along the orbital rim. This hollow is called the tear trough. Traditional lower eyelid surgery does not address the hollow or tear trough. Instead, the tear trough is made less noticeable by removing the bulging lower eyelid fat and/or excess skin that lies above the hollow. In individuals with a very prominent tear trough, removing enough fat to make the tear tough less noticeable may often result in a hollowed eyelid appearance. Lower eyelid surgery with fat repositioning avoids this problem. Instead of removing the fat around the lower eyelid, the fat is draped from the eyelid area over the tear trough, filling the hollow. This achieves two goals, filling the hollow of the tear trough and smoothing of the bulging fat or bag. Many patients are happy with the results of traditional lower eyelid surgery, whether they undergo transconjunctival or trancutaneous blepharoplasty; however, those with a prominent hollow beneath their lower eyelids may choose to undergo fat repositioning for more complete rejuvenation. Although rejuvenation of the lower eyelids is a complex issue, Dr. Achih H. Chen can help you make a well informed decision. For patients considering lower eyelid surgery (blepharoplasty) at our Augusta and Evans, Georgia / Aiken, South Carolina-area practice, an even more complete facial rejuvenation can be created with the addition of other procedures such as facelift or mid-face rejuvenation. Lower eyelid surgery can significantly improve the appearance of the area around the lower eyes and make you look more youthful and vibrant. * Our Facial Plastic Surgeon Dr. Achih H. Chen, serving Augusta and Evans, Georgia; Aiken, South Carolina; and beyond, look forward to discussing your options for rejuvenation of the lower eyelids for a new you! Contact us at the Georgia Center.